Anyone can come on our Learn to Sail Holidays, and can either chose to just have an Activity Yachting course completion holiday, or to go for more formal Crew or Skipper certification. There are no prior requirements for the course completion holiday, but you will need to complete on line eLearning courses, in advance, to be eligible for certification. People going for the different levels can all be together on the same yacht, making these perfect for groups and families of mixed abilities and different holiday preferences. For any course involving formal certification, the training that we offer follows the syllabus laid down by International Yacht Training (IYT) for their recreational sailing programmes. The IYT recreational syllabus is a modular system which offers a very flexible approach, and courses have wide international recognition. Beginners can easily be trained to an International Crew level in a week, while those with prior experience can get to a Flotilla or Bareboat Skipper standard, with ICC assessments available for anyone eligible. Any of these skipper certificates allow you to charter and skipper yachts on your own in the future. There are on line eLearning theory courses available for each level, and these need to be completed in advance. This allows us to concentrate on the practical training during the holiday, with everyone working to the level that is appropriate for them. Practical progress is by ongoing assessment, and at some stage during the sailing week, there will be a multiple choice written test for the theory which will be based on the eLearning for that level, and can take one or two hours to complete.. Completing the eLearning can take anything from a few hours for a crew course, to over 30 hours for a Bareboat Skipper or ICC. This totally depends on your existing knowledge. The only purpose of the eLearning is for you to learn and understand the content, and each course must be completed to ensure that all sections are covered. The more existing knowledge you have on the subject, the faster you should progress. There is no initial fee to start the eLearning, which means anyone unsure of their level can start doing them to see where they are at. There are then costs either for the issuing of certificates after the training, or for certain more advanced parts of some eLearning courses. This flexible approach ensures that all the training we provide, follows internationally recognised standards and that we can issue appropriate, recognised certification. Equally it is essential that we do not forget that most people choosing to do their training with us are also looking for a holiday, and that often in any group or family not everybody will eventually want to become a skipper. Please see below for further guidance and details on the options available. This is our traditional Learn to Sail holiday which we have been operating for over 20 years. You spend a week on a yacht with an instructor and you sail with the flotilla. During the week you receive training to the same level as the International Crew Certificate, but there is no written test to do and no certification is issued. This is the default option that anyone who has not completed one of the other eLearning courses prior to the holiday ends up doing. It is ideal for families or groups that are on a yacht where perhaps one or two people are looking to train to a skipper level but the others just want a fun holiday. An Activity Yachting course completion certificate can be issued to anyone that wants one including junior ones for those under 14 years of age. This is a course for complete beginners or those with limited existing knowledge which will provide training to enable them to become an active and useful crew member on a small sailing yacht. It is open to anyone of 14 years and older, and on the yacht you will be issued with an IYT Log Book, the, "International Boating & Sailing Passport", which details the full syllabus of the Recreational Training Programme. This is also a Log where you can record the details of the sailing and training that you do. The International Crew covers from Modules 1 to 11, and at the end of the training, a Gold Seal and School Stamp is added as evidence of course completion. Modules are both theoretical and practical, and prior to completing the course you must complete an on line eLearning course, which is currently free of charge. Assessment will be on an ongoing basis over the week and at some stage there will be a multiple choice written test on the eLearning Theory. By the end of the week successful candidates will be a useful crew member on any small yacht. An IYT Crew Certificate will be applied for after passing the assessment. This will be issued directly by IYT and currently costs 20US$. Certificates are sent free of charge by air mail post, with additional fees if a courier is used. Fees are paid directly to IYT who will email you a link for payment once the certificate is applied for. All IYT certificates must be renewed every 5 years to ensure that contact details and photos are up to date, and this is done directly with IYT. The IYT Marine Communications course (Very High Frequency – Short Range Certificate) is issued under the recognition of the Republic of the Marshall Islands. They operate one worlds largest Ship registries, and it is intended for all marine environments and follows International standards. The course provides radio communication training for recreational boating. Students will learn the correct use of the on board VHF radio, how to send a distress message correctly and learn about how EPIRBs, SARTs, AIS and DSC-enabled radios, are used effectively in marine communications. Possession of a VHF operator's licence is often a legal requirement when you charter a yacht, although this may not always be enforced, and possession of a VHF licence is now required by IYT for anybody hoping to get a Skipper certificate. IYT offer a free eLearning course which anyone can do in advance, so that everybody can get proper training. Anyone wanting to get the certificate should then complete an on line assessment which costs 95US$and then you must do an additional practical and written assessment at an IYT Training establishment. In our case we can do this on the Yacht during a normal training holiday when you will be using the VHF on a daily basis. An IYT Crew Certificate will be applied for after passing the assessment. This will be issued directly by IYT and certificates are sent free of charge by air mail post, with additional fees if a courier is used. If fees apply then they are paid directly to IYT who will email you a link for payment once the certificate is applied for. This is an entry level skipper certificate. There are no nationality restrictions or mandatory prior requirements for this certificate, although it is expected that people should already have relevant prior experience and should be at least at a crew level. It is open to anyone of 18 years and older, and on the yacht you will be issued with an IYT Log Book, the, "International Boating & Sailing Passport", which details the full syllabus of the Recreational Training Programme. This is also a Log where you can record the details of the sailing and training that you do. The Flotilla Skipper covers from Modules 1 to 26, and at the end of the training, a Gold Seal and School Stamp is added as evidence of course completion. You must either already have a VHF licence to apply for this certificate or you must complete the IYT one as detailed. Modules are both theoretical and practical, and prior to completing the course you must complete an on line eLearning course, which is currently free of charge. The eLearning Theory and training up to Modules 26 cover the same content as for the Bareboat Skipper, with the main difference being that you need less practical experience to get to this standard. crew safety briefing and general crew management. 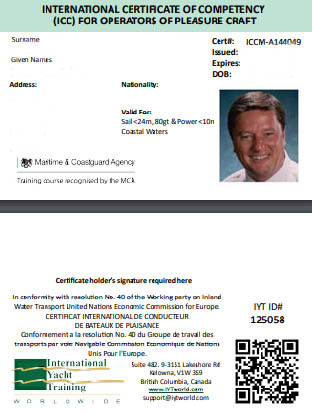 any other aspects relevant to gaining an International Watchkeeper/Flotilla Skipper Certificate. Assessment will be on an ongoing basis over the week and at some stage there will be a multiple choice written test on the eLearning Theory. By the end of the week successful candidates should be competent to take charge of, and to skipper a yacht themselves in a Flotilla environment. 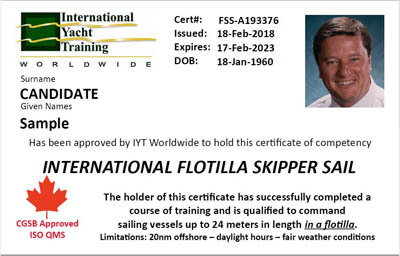 An IYT Flotilla Skipper Certificate will be applied for after passing the assessment. This will be issued directly by IYT and currently costs about 30US$. Certificates are sent free of charge by air mail post, with additional fees if a courier is used. Where you may also be getting a VHF certificate, both will be applied for at the same time. Fees are paid directly to IYT who will email you a link for payment once the certificate is applied for. Once you have obtained a Flotilla Skipper it is intended that for your first few times going out as skipper, that you should sail in company of other yachts where there are more experienced Skippers to advise and assist you. This can either be as part of a Flotilla on a future holiday, but it could equally be sailing in company with friends. Once you have obtained sufficent experience you can then still charter a yacht on your own at a later stage with this certificate, without sailing with other yachts. You can see that it is on the list of approved Skipper licences in Croatia for Bareboat Charter at number 35a. You can view this list here. Many people however will want to upgrade to a higher level Skipper certificate at this stage, and in this regard the Flotilla Skipper Certificate is a perfect stepping stone for a beginner to work up to a Bareboat Skipper level. ideally have previous skippering experience, either through having a lower level skipper certificate like the Flotilla Skipper or having taken charge while still under the command of another more experienced skipper. 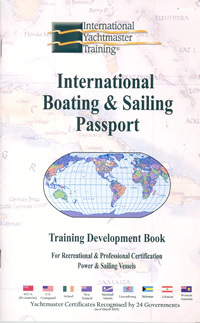 You will be issued with an IYT Log Book, the, "International Boating & Sailing Passport", which details the full syllabus of the Recreational Training Programme. This is also a Log where you can record the details of the sailing and training that you do. The Bareboat Skipper covers from Modules 1 to 26, and at the end of the training, a Gold Seal and School Stamp is added as evidence of course completion. Over the week, you will cover all of the following items. You are already expected to be familiar with most of these areas but you are expected to be able to go into them in more detail than if you were doing a lower level certificate. any other aspects relevant to gaining an Bareboat Skipper Certificate. Assessment will be on an ongoing basis over the week and at some stage there will be a multiple choice written test on the eLearning Theory. By the end of the week successful candidates should be comptent to take charge of, and to skipper a yacht themselves in a Flotilla environment. 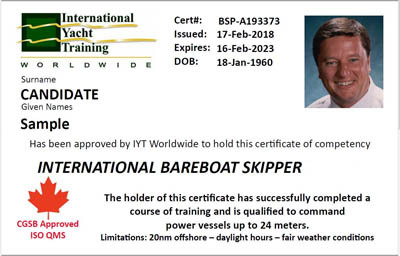 An IYT Bareboat Skipper Certificate will be applied for after passing the assessment. This will be issued directly by IYT and currently costs 50US$. Certificates are sent free of charge by air mail post, with additional fees if a courier is used. Where you may also be getting a VHF certificate, both will be applied for at the same time. Fees are paid directly to IYT who will email you a link for payment once the certificate is applied for. The ICC is the International Certificate of Competence for operation of Pleasure Craft of up to 24mt, and it is issued under Resolution 40 of the United Nations Economic Commission for Europe (UNECE). Each government that is signed up to the Resolution can choose which sailing and licencing organisations can issue ICC's on their behalf to its citizens or residents..
International Yacht Training is approved by the UK government to issue ICC's to UK citizens or residents. Citizens of other countries that are not signed up to Resolution 40 can also be awarded an ICC, but citizens of countries that are signed up to the resolution, which include most European countries, can only get an ICC from an authority approved by their own country. Who May Receive An IYT ICC Based On Resolution 40? In accordance with UNECE Resolution 40 (Revision 4), citizens and residents of countries (listed below), that are signatories to Resolution 40, will be obliged to obtain an ICC from their own national issuing authority and not from IYT (with the exception of the United Kingdom and Latvia, see below). The only exception for IYT to issue ICCs to citizens of these countries, is if the applicant can provide proof of residency* in a country not on this list. For example: an Austrian National living in Spain or Greece that can provide “proof of residency” in Spain or Greece would be allowed to receive an ICC from IYT. *Proof of residency (examples) Utility bill (electric or gas), Property tax bill, Telephone bill, Insurance bill, IYT can issue ICCs to any other country’s citizens that are not listed below. As of May 2016 the following countries have adopted resolution 40. Please note that this means that citizens of these countries CAN NOT be issued with an ICC by IYT, and can only be issued with an ICC from an authority approved in their own country. This is a certificate of competency for a Sailing vessel with an auxiliary engine, of up to 24mt for use in Coastal waters. It also includes approval for a use of a power vessel of up to 10mt to cover for where this may be required such as going to the shore in a tender with an engine. This is a certificate of competency for a Sailing vessel with an auxiliary engine, of up to 24mt for use in Coastal waters and inland waters. This version includes a CEVNI test which covers the regulations for navigating on inland waterways in Europe. It also includes approval for a use of a power vessel of up to 10mt to cover for where this may be required such as going to the shore in a tender with an engine. We can train and assess anyone of eligible nationality that is 18 years and older, as part of a Learn to Sail Holiday. There are no mandatory prior requirements, although it is expected that people should already have relevant experience and should be at least at a crew level. The training covers the same syllabus as if it was for the Flotilla Skipper and also follows from Module 1 to 26 in the IYT Sailing Passport. Prior to the practical training and assessment, you must complete an on line eLearning Theory course. This includes a VHF element which you must also complete. The eLearning is free to complete but then at the end there is a fee of 140US$ which will allow you to complete an on line assessment, and this will then issue you with an ICC Theory Course Completion Certificate. This fee will also cover the cost of issuing the ICC and VHF Certificates, after the practical training. any other aspects relevant to gaining an ICC. Assessment will be on an ongoing basis over the week and at some stage there will be a multiple choice written test on the eLearning Theory. By the end of the week successful candidates should be comptent to take charge of, and to skipper a yacht themselves.